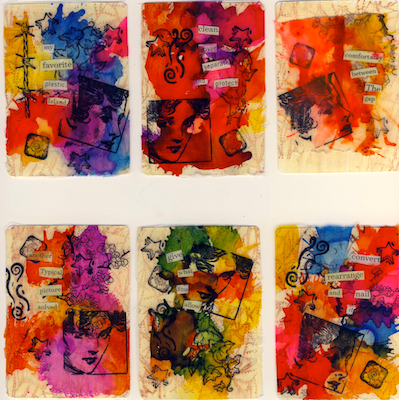 Last week I took a short break from sculpting Ornimals and created some artist trading cards (ATCs) for my art guild. 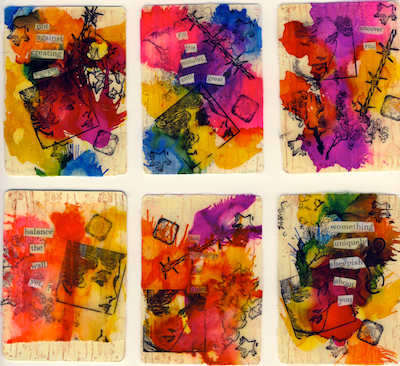 We were challenged a few months ago to create artist trading cards for a guild swap. With the deadline drawing near, I needed to get my act together. Of course I drew a blank on what I wanted to create. I didn’t want to make traditional polymer clay artist trading cards. Then it dawned on me one night that I could use liquid polymer clay to create “paper.” I could use that as the base for my ATCs. 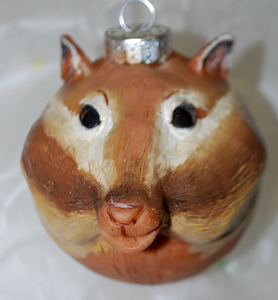 But I didn’t want to simply color and stamp layers of liquid polymer clay. Another light bulb went off. 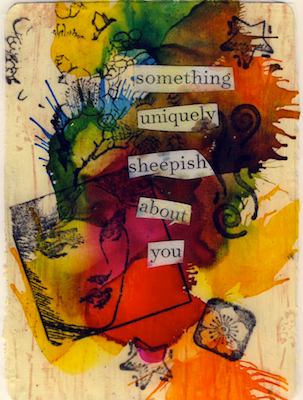 I would create Found Poetry Artist Trading Cards and embed the words in the liquid clay. I’m not sure where I first heard the phrase “found poetry.” It could’ve been Quinn McDonald. Or maybe it was Dayle Doroshow. Either way I’m sure I didn’t just coin the phrase. Not being quite sure of the process, I made up my own. I pulled out a few magazines, found some pages with lots of text, and circled every few words, usually every 5th to 7th word. Then I cut out the circled words and put them in a pile on my table. This is where the fun began. Looking at all these words, including nouns, verbs, adjectives, and articles, I began to sort them into phrases and sentences. This is a rather intuitive process. Sometimes the phrases made sense. Other times they didn’t make sense but the words sounded interesting together. And that was the whole point. To create phrases and sentences that were sometimes silly and sometimes rather profound. If they made sense, great. If not, all the better. Using a simple process of layering liquid polymer clay on glass, the words were embedded into one layer of clay. 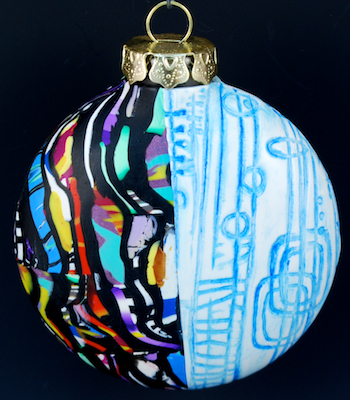 Additional layers were stamped and colored. Then the liquid “paper” was removed from the glass and attached to painted playing cards. 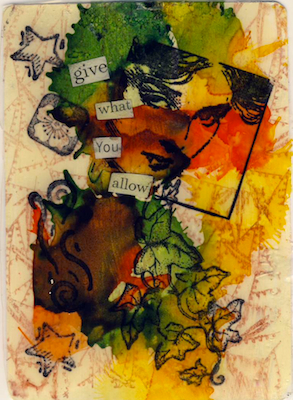 In the next post I’ll share some of the ATCs I received in the guild’s swap. Categories: Amy's Art, Creativity, Inspiration, Mixed Media | Tags: Artist Trading Cards, Creativity, Dayle Doroshow, Found Poetry, Mixed Media, Polymer clay, Quinn McDonald | Permalink. I’m in the process of packing artwork for my first show of the holiday season. 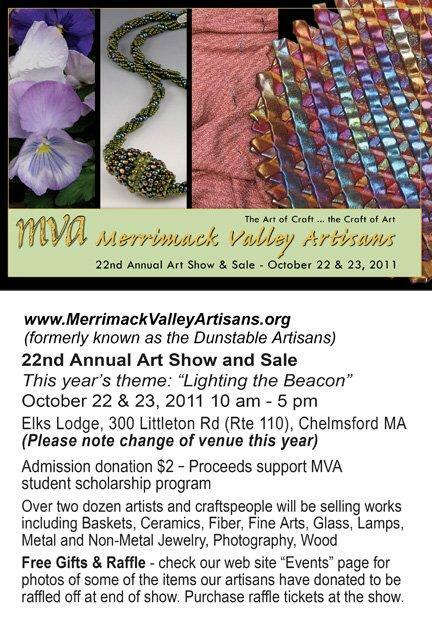 This weekend I’ll be selling my artwork at the Merrimack Valley Artisans 22nd Annual Art Show & Sale. This is my first show with MVA (formerly the Dunstable Artisans Guild). The show is at the Chelmsford Elks Lodge, 300 Littleton Road, Chelmsford, MA. Show hours are 10-5 each day. Admission is $2.00. If you’re in the area, please stop by! Accompanying me to the show will be three of my newest Ornimals: a cardinal, a black-capped chickadee, and a puffer fish. 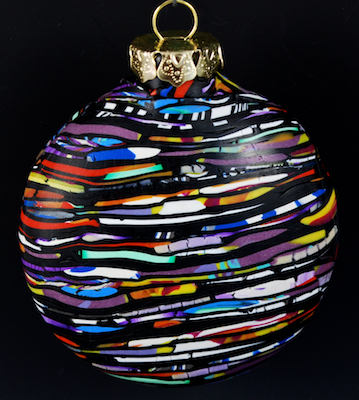 These Ornimals are sculpted over 55mm glass ornaments. Chickadees are one of my other favorite birds. Their bird song makes me giggle; “chick-a-dee-dee, chick-a-dee-dee.” I smile when I hear them chirping away as I fill the bird feeder. Sometimes I watch them watching me. They’ll just sit on the branch until I finish filling the feeder. 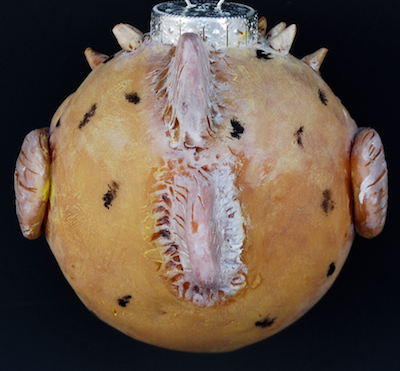 I’m not sure what draws me to puffer fish. Something about their faces. I always wanted one for our fish tank. But we didn’t have salt water fishies. When “Finding Nemo” came out I loved Pixar’s rendering of the puffer fish, especially when he inflated. 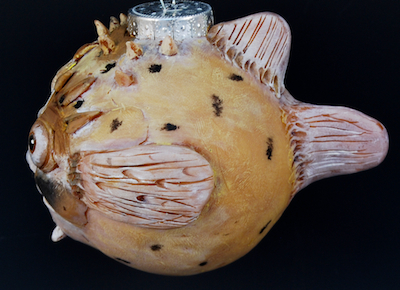 I think the puffer fish I used for my interpretation was a brackish water species. 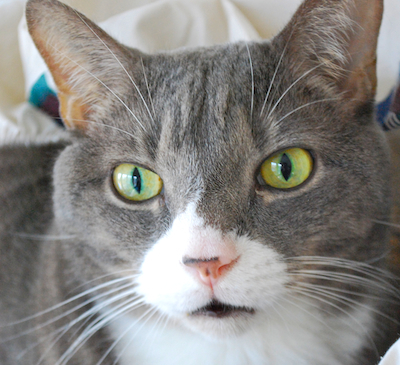 Here he is….now affectionately named Yoda. It might be fun to make some more puffer fish in shades of green and blue. Or maybe one fully inflated. 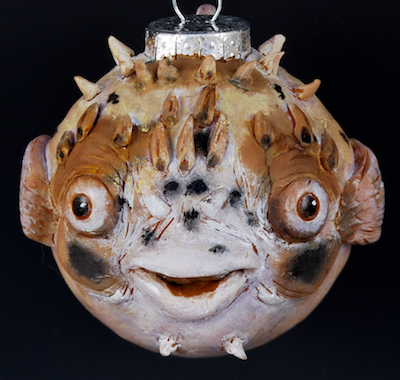 Categories: Amy's Art, Ornaments, Polymer Clay, Sculpture | Tags: cardinals, Merrimack Valley Artisans, ornaments, Polymer clay, Puffer Fish, Sculpture | Permalink. Earlier this month fellow polymer clay artist Alice Stroppel shared a video of her creating the “Stroppel Cane.” The video was rapidly shared via social media and Alice’s cane became an overnight success. Now I am not a polymer clay cane-making kind of gal. Well, that’s not completely true. I’ve made some simple canes, one or two simple face canes, and a couple leaf canes. Mostly basic stuff. Intensely detailed canes, however, are not my thing. The simplicity of the Stroppel cane intrigued me. I also wondered how my version would turn out knowing that in order to create the Stroppel cane, one uses left over bits and pieces of cane ends. Not something I have in abundance. 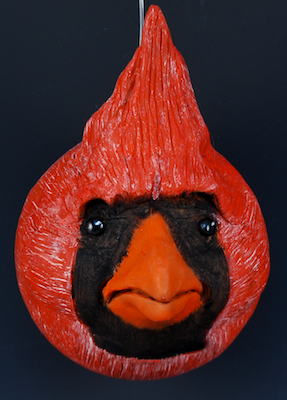 I do, however, have a few bags of scrap clay sorted into various color families. So I figured I might find some cane ends in those bags and then I could fill in with marbled twists of other colors. Following Alice’s directions, I created my version of the Stroppel cane. The end result is what I call Kente-like cloth. 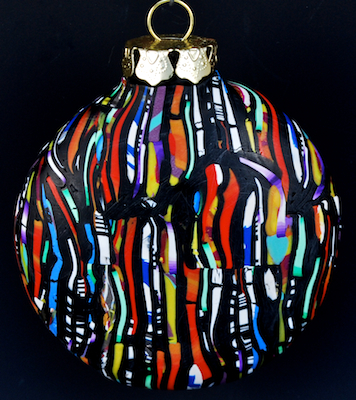 And since I’m on in ornament making mode, I decided to use my Stroppel cane-Kente-like cloth to cover some disk shaped glass ornaments. 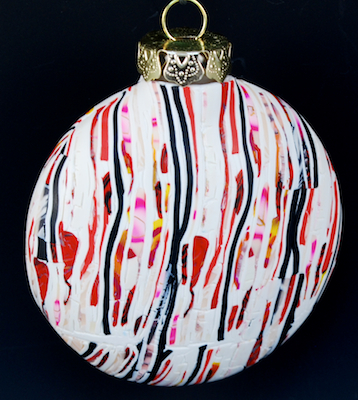 Categories: Amy's Art, Creativity, Ornaments, Polymer Clay | Tags: Alice Stroppel, Creativity, Inspiration, Kente Cloth, ornaments, Polymer clay | Permalink. The goal of this project is to raise $1,500.00 by November 28, 2011. The funds raised for this project will help Susan document what it means to be a working artist today by working as an apprentice to artists across the country. Susan is no stranger to working as an artist apprentice. 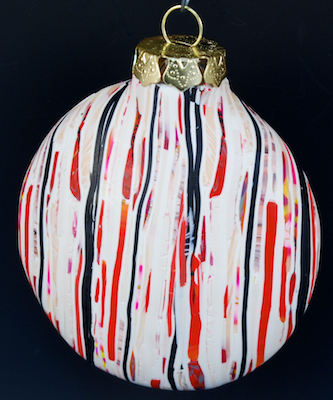 She did just that last fall when she traveled to Connecticut and Washington, D.C to work as an apprentice to a jewelry artist, a ceramic artist and a glass artist. 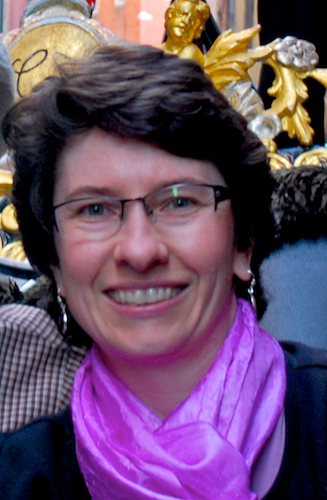 This time, however, Susan needs your assistance to make the Apprenticeship Project even bigger. Her initial apprenticeship experiences appeared as posts on her blog The Daily Art Muse. Now Susan’s goal is to capture this documentation in three books: one book on the life of an artist, one photo essay book, and one book on her life and what brought her to this project. Now isn’t this something you might consider supporting? Click on this link to read more about The Apprenticeship Project. You can even ask questions. If you decide to make a donation, your credit card won’t be charged unless Susan reaches her goal of $1,500.00 by November 28, 2011. How cool is that? You can donate as little as $5.00 or as much as $5,000.00. And you can choose a gift to receive based on the amount of your donation. I wouldn’t blog about this if I didn’t believe in the project. Full disclosure: I’m a backer of this project. 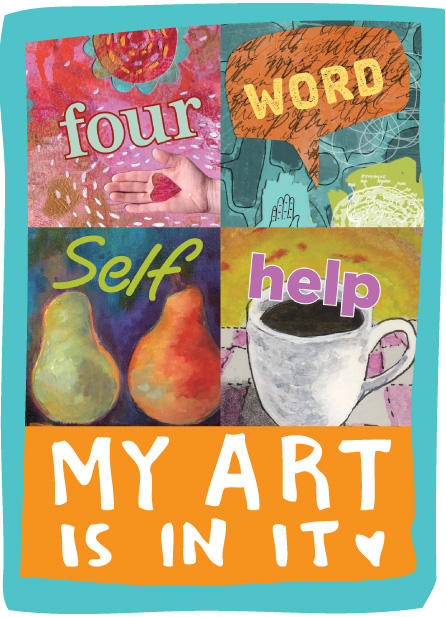 Categories: art, Education, Inspiration, Networking | Tags: art, Daily Art Muse, dreams, Inspiration, Kickstarter, Susan Lomuto, The Apprenticeship Project | Permalink. along with those of others. Categories: Inspiration, Philosophy, Quotes, Spirituality | Tags: compassion, Inspiration, Jack Kornfield, philosophy, Quotes, Spirituality | Permalink. 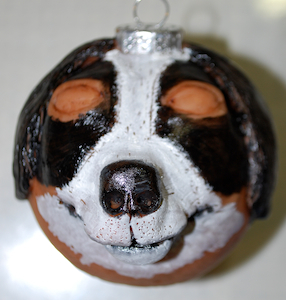 I’ve been busy working away on more new animal ornaments this week. As I make them, I’m thinking of what to call this new line. 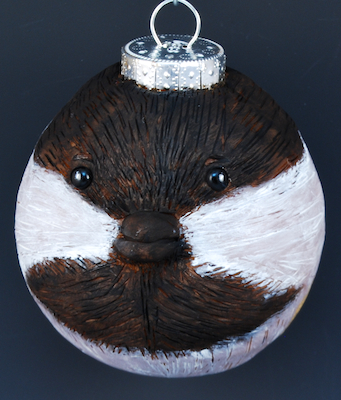 One suggested name is “Ornimals” because these are animal specific ornaments. What do you think? It’s kind of catchy. 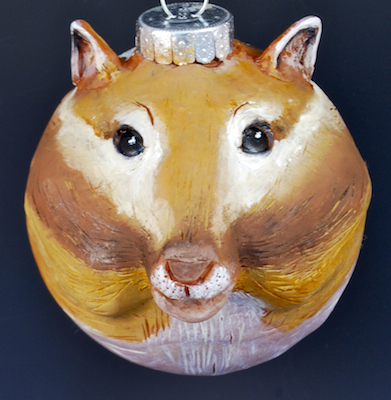 The three new ornimals I’m sharing today include a cat, a dog, and a chipmunk. Some progress pictures are also included. 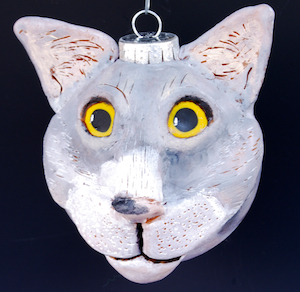 It is only fair that my next cat ornament be inspired by Woody, our oldest cat. When you have two cats, it is like having two kids. Got to be fair and include both of them. We have numerous chipmunks running around our neighborhood. I was inpsired to include one in this line when one dashed across the driveway as I pulled in the other day. Yes, they can be a bit of a nuisance but they are cute. I love Bernese Mountain dogs. I love big dogs. 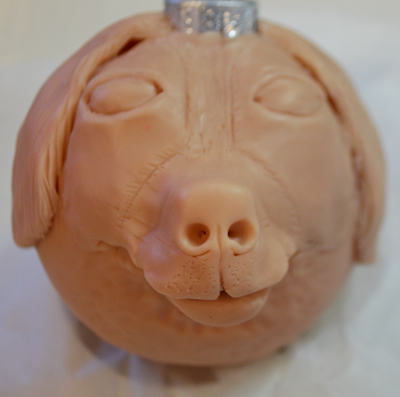 Even though I haven’t owned a dog in many years, I wanted to challenge myself and sculpting a Bernie as my first dog ornament fit the bill. Then I immediately thought I was crazy to even try. Cats I know; dogs, not so much. However, with my trusty iPad propped up on my work table, I found some good images of Bernies that would guide me in this challenge. 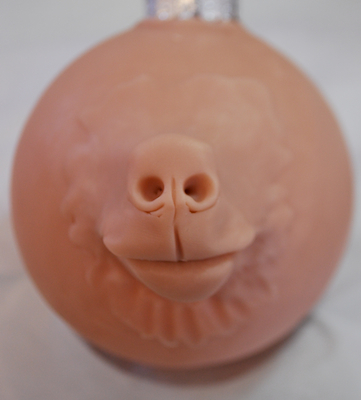 First came the nose and mouth. They have rather large heads so this part wasn’t too difficult, though the SuperSculpey does give this Bernie a rather cow-like appearance. Next came the ears. Ugh. I don’t like ears. I don’t even put ears on my human-inspired heads. But an “earless” Bernie would be rather scary. Thankfully Bernies have rather simple ears. Longish, flatish, nothing too dramatic. Then came the eyes. Oh boy. This will take some time. 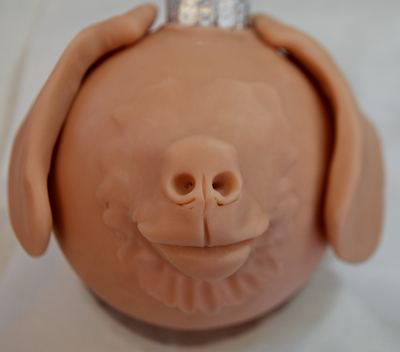 Eyes are a challenge for me on all of my sculpted heads. 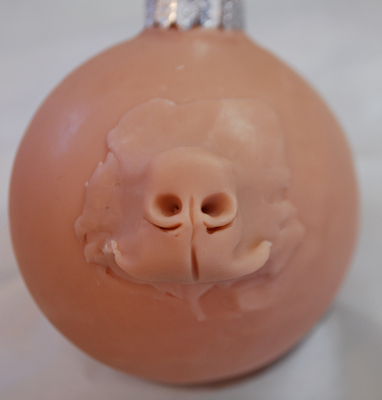 I often place them a little too high on the face and that changes the entire appearance of the piece. 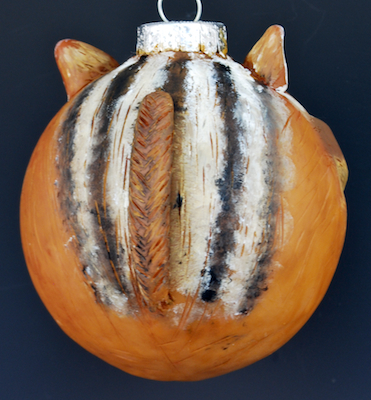 So I first tried a cane slice, similar to what I’ve done with my cat ornaments. 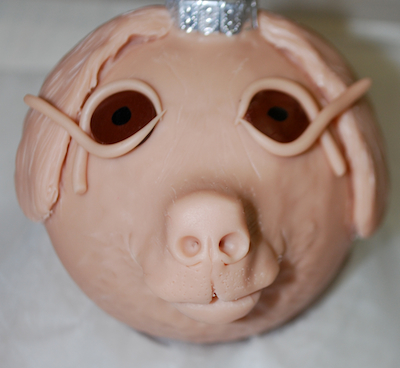 Placed the cane slices on the face and mock up the eyelids. Ugh. He looks like he is wearing a bad pair of sunglasses. 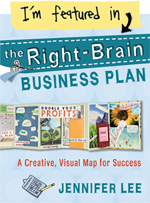 Scrap that idea and sleep on it. As I lay in bed I thought about the technique I use to create eyes & sockets on my human heads. 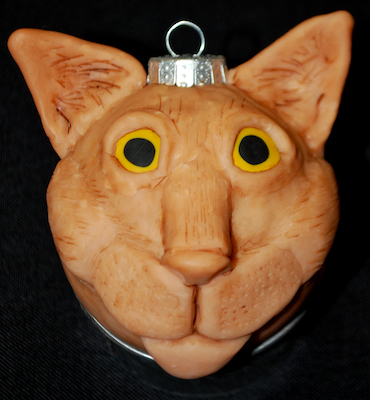 I toy around with an idea and how it might work on an ornament sculpt. The next day I end up with this result. I like this better than the cane slices. At this point I also have to remind myself that all sculptures look rather unattractive at this stage; fleshy and ghostly (or ghastly, take your pick.) It is only when they receive an antique wash and paint that they start to come alive. I’m pretty happy with the how she turned out. Painting on the eyes was a little dicey because, unlike acrylic paint, oil remains fluid and moveable until completely dry. Next time I might try acrylics for comparison. And if you have an iPad or other tablet device, I highly recommend using it as your online sketchbook or source of image inspiration in the studio. Yes, I could’ve printed out a couple pictures and put them in my sketchbook for reference. But I can’t enlarge the static pictures in my sketchbook like I can on the iPad. That is one of the many things I love about my iPad when it comes to creating artwork. 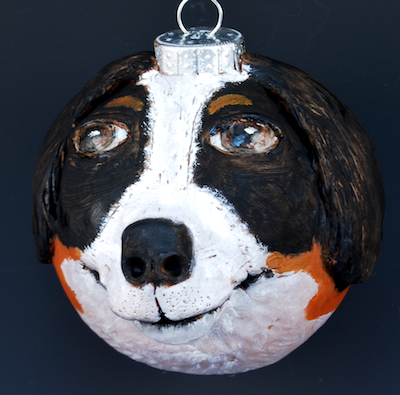 Categories: Amy's Art, Ornaments, Polymer Clay, Sculpture | Tags: Bernese Mountain Dogs, chipmunks, iPad, ornaments, Polymer clay, Sculpture | Permalink. Categories: Inspiration, Philosophy, Quotes, Spirituality | Tags: Celtic spirituality, Inspiration, John O'Donohue, philosophy, Quotes, Spirituality | Permalink.